March 17 2016: Hate speech and discrimination are common in Bosnia-Herzegovina – jeopardising the progress it has made in overcoming prejudice. But NGOs and individuals are fighting back, as Elma Karahodžić reports. According to non-governmental and international organisations, hate speech in Bosnia-Herzegovina is present in the media, schools and among the public the public. Because of its comparison to freedom of expression as a fundamental human right, hate speech has become generally accepted as a form of expression and action.But over the last few years, numerous initiatives have been launched by non-governmental organisations (NGOs), informal groups and individual activists related to the prevention of hate speech and discrimination in Bosnia. The Supergrađani/Supergrađanke (Supercitizens) initiative was launched by the OSCE Mission to Bosnia and Herzegovina in 2013. It brings together 19 coalitions that fight against hate speech, prejudice, intolerance, discrimination and other forms of offensive behaviour. The initiative’s website provides the space to report perceived instances of hate speech, offensive graffiti, physical violence or damage to property. Established in June 2013 by the municipal Youth council of Novo Sarajevo, the coalition Zanemari razlike Coalition (Ignore Differences) was created with the goal of fighting hate speech and creating a society without prejudice. Its work focuses on preventive measures in response to negative phenomena occurring within the community, such as offensive graffiti or incidents derived from hate, which they publicly condemn, as well as calling on others to do the same. Mirela Geko, from Zanemari razlike, said that she is particularly pleased with the fact that the coalition is trying new approaches each year to reach different groups of youth in an effort to solve local problems. “Last year we particularly focused on sports and the reduction of hatred on the sporting fields. Male and female players stressed that they do not like the situation and that it bothers them,” stated Geko. She added that this year the coalition also started covering issues related to religion and faith in an effort to show youth that the sermons of every faith proclaim that it is vital to respect others and that we are all alike. Geko believes the biggest challenge is not to allow politics to control and divide people in Bosnia, and people should be aware that their differences are, in fact, the root of their prosperity. Student Eldar Komar, who is an activist for the Youth Initiative for Human Rights in Bosnia-Herzegovina and a board member of the Youth Council of Stari Grad, believes that Bosnian society is in transition and is subject to influences, changes and problems. He explained that, as a result, people are not aware of the consequences of hate speech related not only to communication between members of different ethnicities or nationalities, but also to other aspects of life in Bosnia.“Our country’s NGO sector, especially those organisations that deal with anti-discrimination policies and human rights, tries to prevent hate speech and its influence on the youth. However, it is not possible to solve this problem without the full inclusion and participation of citizens and their awareness of this problem’s existence,” said Komar. The Coalition to Combat Hate Speech and Hate Crime was established in 2013 to work towards improving the legal framework surrounding hate speech and hate crimes. The coalition is also committed to improving the implementation of existing laws. It has brought together 10 NGOs from across Bosnia that deal with promoting human rights and tolerance, as well as fighting hate speech and hate crime. The Center for Youth in Prijedor, KVART, in Prijedor can be credited for the successful work of this coalition. KVART has run a range of initiatives to remove graffiti and hate speech from public spaces over the past two years. 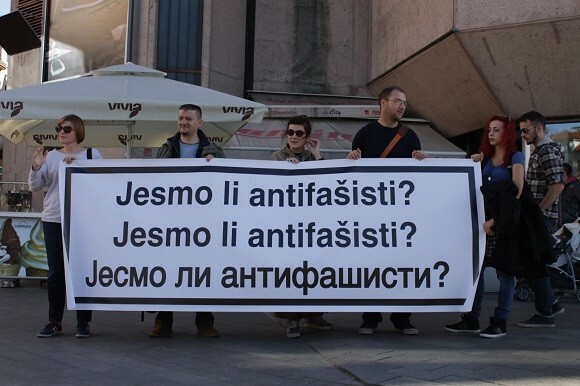 “The motivation behind dealing with these problems is primarily due to the fact that members of our organisations were, at one time or another, victims of hate speech and attacks from radical right wing parties and political representatives in our city,” said Goran Zorić, Executive Director of KVART.